Katie has lived in Yukon all her life and worked in Mustang for over three decades. 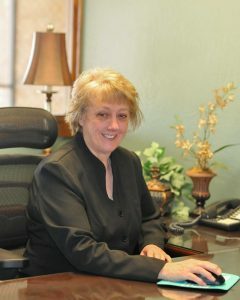 She has been very involved in the community having been a member of the Mustang Rotary and Mustang Chamber of Commerce. She is also a member of St. John’s Catholic Church in Yukon. Katie loves her family! She has two children: David and Jolie and four grandchildren: Audrey, Collen, Matthew and Angela. She enjoys reading and cooking in her free time. Katie began her banking career in 1978. She took her first lending role in 1993 and has not stopped since. Katie graduated from the Oklahoma Banking Association Consumer Lending School in 1995 and a year later in 1996 graduated from the Oklahoma Banking Association Commercial Lending School. When she started with YNB Mustang in 2017 she brought over two decades of lending experience. Katie specializes in consumer, commercial, construction and land loans. Visit Katie at the YNB Mustang Branch and get the loan you need from an experienced, efficient and friendly lender!